Apple updated its Apple Store app for iOS on Wednesday with a few feature additions, including the ability to bypass a pesky carrier preauthorization requirement when buying iPhone. Apple Store version 4.4 brings a few minor updates to Apple's dedicated online shopping app. 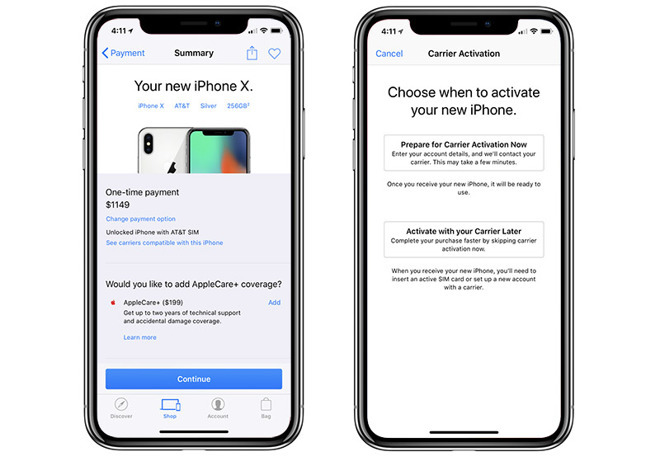 The biggest change, at least for iPhone buyers, is the option to bypass Apple's carrier preauthorization check when purchasing an AT&T, Verizon or Sprint handset at full price. Those who elect to skip authorization can activate the phone on their carrier's network when they receive it, speeding up the checkout process. Prior to today's update, Apple in some cases required buyers to enter a valid wireless phone number as part of its iPhone purchase process. The procedure ties the new phone to its buyer's account, acting as a form of security during shipping and streamlining setup once the device arrives. In addition to the change in preauthorization handling, the Apple Store app now integrates a scanner — an iPhone or iPad camera — for adding credit card information at checkout. Apple commonly implements smart scanner functionality in its first-party apps, including the App Store and Wallet, to glean data from captured images using optical character recognition. The feature is normally used for setting up credit or debit cards, redeeming iTunes gift cards and other functions that benefit from automated text entry. Finally, Apple added unnamed iOS 11 enhancements to the app. Apple Store version 4.4 is a free 73.8MB download from the App Store.